When you sign up for our Catch Direct home delivery service you will gain access to the local, sustainable species of fish listed below. Cod is the fish on which the Atlantic fish industry was built. Not only is it one of the most important fishes in the Atlantic fishery but it holds a special place in the history of the state of Massachusetts; a golden cod hangs in the State House. Cod is popular in many dishes, with a mild flavour and a dense, flaky, white flesh. It can be baked or fried and is terrific in fish or seafood "chowdahs." Pollock is another important species in the Atlantic fishery. Large schools appear in May and are prevalent throughout the summer and are fed on by many larger predatory fishes, like bluefin tuna, and mammals, like porpoises and seals. 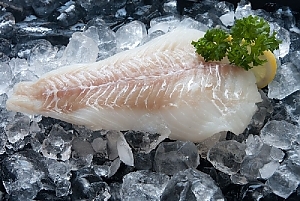 It has a white flesh that can be filleted like cod although it has a somewhat stronger flavor. It is often used to make the seafood salad found in delis and sandwich shops. If you want a traditional New England meal, try flaking pollock, making it into fish cakes, served with baked beans. Haddock is found on both sides of the North Atlantic. It's a popular food fish and is widely fished commercially and recreationally. Similar to cod and often caught with it, haddock has an even cleaner, whiter flesh, with a subtle smoky flavor that makes it much desired for traditional fish-and-chips as well as a multitude of baked stuffed recipes. As for most fish, the freshness of a haddock fillet can be determined by its firmness, translucency and lack of fishy odor. Both haddock and cod fillets are referred to as scrod at Fisherman's Wharf and elsewhere. Grey sole is the commonly used name for certain flounder fillets. They are a desirable ingredient in many haute cuisine dishes served in the world’s finest restaurants, like Baked Stuffed Sole with Newburgh Sauce and Sole Amandine. The flounder itself is one of the flatfishes. As they mature, one eye migrates so that both eyes are on the same side of their head. This allows them to lie flat on sandy ocean bottoms to escape predators. They also have a chameleon-like ability to change their coloration for camouflage. Monkfish, also called angler fish, is not the prettiest fish in the sea but it is growing in popularity as a food fish. Europe has known it as a uniquely sweet and delicious delicacy for years and it is getting its due on these shores just recently. Use it in some of your more exotic recipes. It stands up well to spicier and stronger ingredients and works well in a variety of recipes, from stir-fry to ceviche. Redfish is also called Acadian redfish, frequently found and caught in New England waters. A smaller fish with smaller fillets, it is an easy target for younger anglers as they will take almost any bait. Endangered for a time, the population has been recently declared fully rebuilt. Enjoy it with clear conscience. Yellowtail is another of the flounders, with fillets similar to grey sole. They can be used the same way and make great fried fillets. Find your best tartar and remoulade recipes and fry these up for a wonderful fish fry! Another previously under-appreciated fish, the hake is finding new popularity. Related to the cod and haddock, it can be used in the same ways. The fillets are usually smaller but are quite tender. Bake it wrapped in prosciutto or bacon to preserve its moist texture and discover a new taste sensation. Use the leftovers as the base for fish chowder and double your pleasure. It’s another flatfish that you may know by another name. Anglers know it as winter flounder because they migrate inshore during the winter where they are an easy catch. Epicureans know them as lemon sole and treasure the firm and tasty fillets for their very best recipes. The smallest of the flounders, dabs are delicate and delicious. They should be used in the simplest recipes because you don’t need a lot standing between the favor of their dainty fillets and your palate. A real delicacy!